Monday spent getting over jet lag and David's unforgettable hospitality. Seven people get through seven bottles of wine! Sorting the cars is followed by a swim then a leisurely trip down the river in David's power boat. Pass several Osprey's nests. 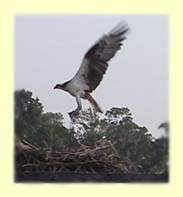 Each river house has its own pole for the Ospreys to nest on. You just aren't 'in' if you don't have one! The one in the picture was feeding her young when we went past in the boat. You can just see the fish in her claws. Tuesday 11th we set off for Ocean City - 130 miles East, right on the Atlantic Coast. Have to get our piccies taken at the beach. Our four cars set off and on the way pick up another eight Healeys at Chesapeake College. Everyone excited to see our car. It is quite famous now. A special photo shoot has been organised on the boardwalk, local fuzz there and local press sniffing around. Julian tries to talk attractive young female copper into giving up her job and coming with him to Lake Tahoe. She tells him 'not this week'! Behind the cars is the beach and Atlantic Ocean. About 3,000 miles is Scotland. The other way, West is 3073 miles to Sacramento. Route 50 now stops there but we will make the last 100 miles to the Pacific Ocean and Golden Gate Bridge. 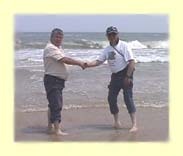 Peter and Julian shake hands on the edge of the Atlantic Ocean. I'm not allowed to publish the one of Julian with the gorgeous bikinied blonde. I think there is a blackkmail chance here!. Drive back to David's on the start of the famous Route 50. As it says - 3073 miles to Sacramento. We are not setting off finally until the morning of the 12th. Another gastronomic treat is in store for us. Crabs and beer at Rockall harbour Inn. Different. Everyone feeling reluctant to leave this oasis of peace. but the open road beckons. To-morrow we will finally be on our way.